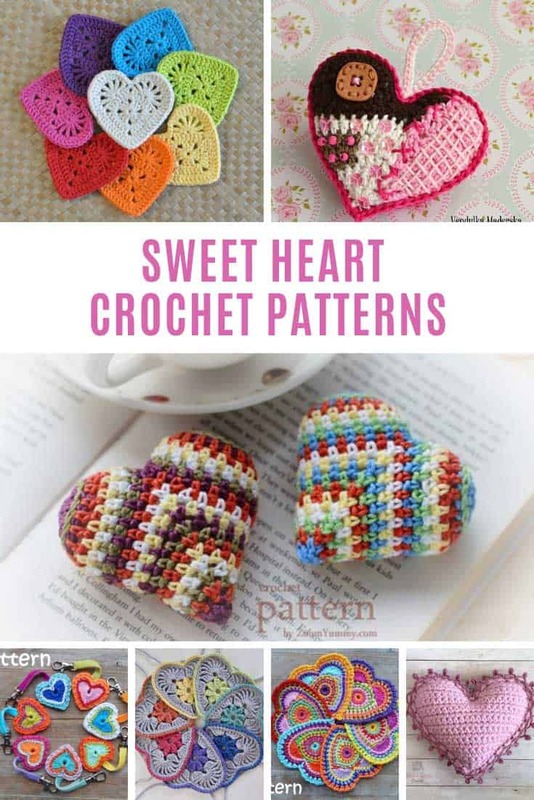 Sweet Heart Crochet Patterns for Valentine's Day or Any Day! 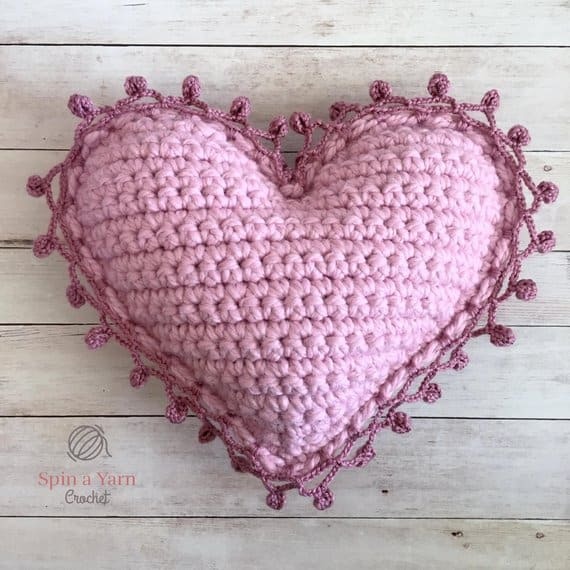 Home > Holidays > 2019 Valentine's Day Food, Decor & Craft Ideas > Sweet Heart Crochet Patterns for Valentine’s Day or Any Day! 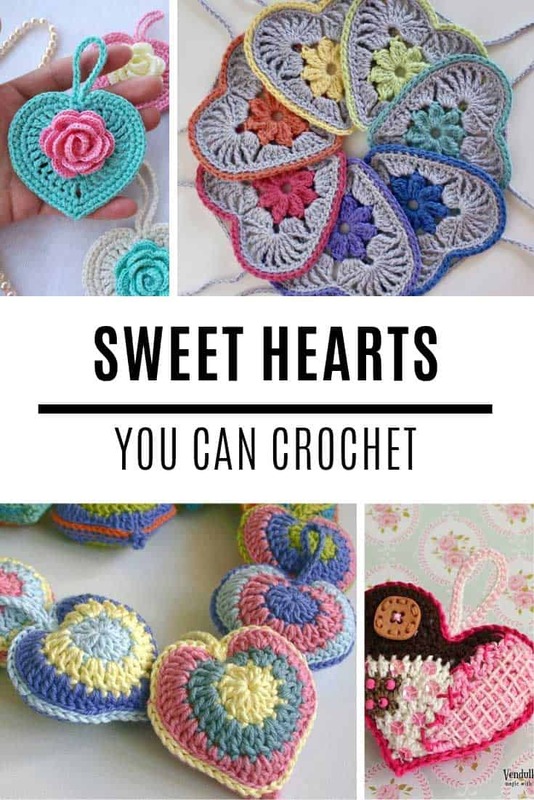 Sweet Heart Crochet Patterns for Valentine’s Day or Any Day! 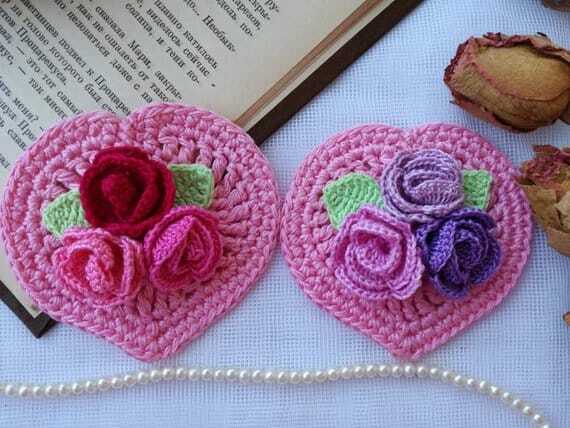 If you’re looking for heart crochet patterns you’re going to fall in love with today’s projects. 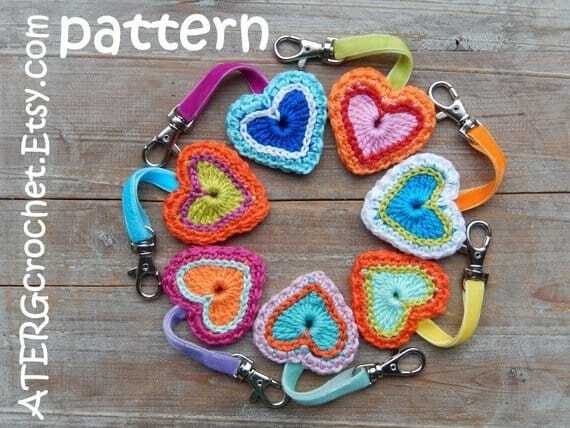 Make a garland or a keychain, add them to blankets or baby clothes. The ideas are endless! 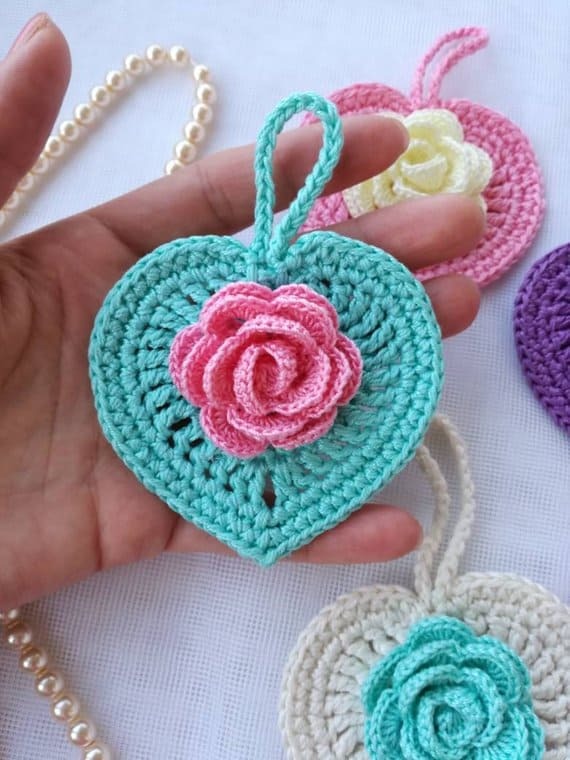 My friend is currently heading up a group of crafty crocheters who are making hearts to gift to mamas whose babies are in the NICU on Mother’s Day. 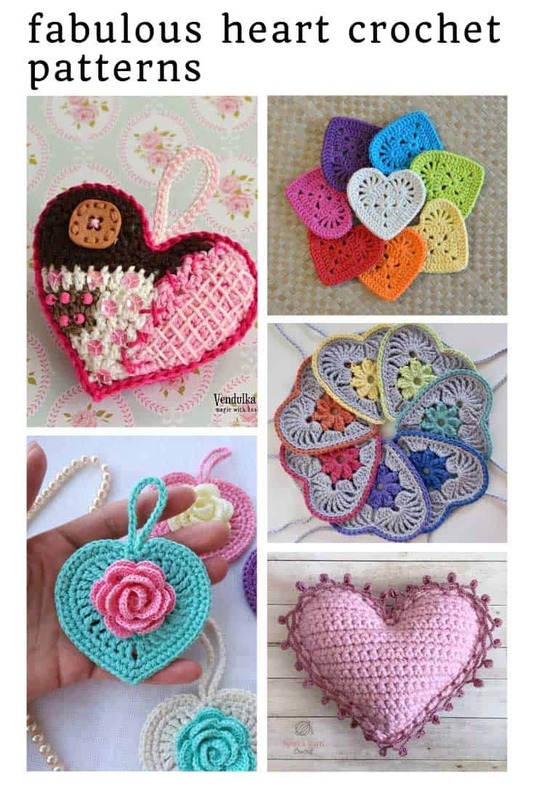 I was looking for a heart crochet pattern to work from and oh my did I find so many BEAUTIFUL projects I knew I just had to collect them all up and share them with you! 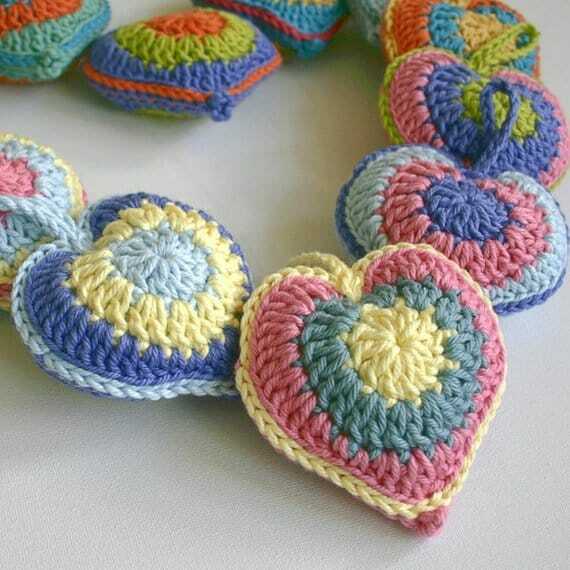 Valentine’s Day is right around the corner so you could use your hearts to make a crochet garland. Or you could turn them into a sweet baby mobile. Or add them to blankets, tote bags or baby clothes. You could scent the padded ones with essential oils and put them in your drawers to make your clothes smell nice. 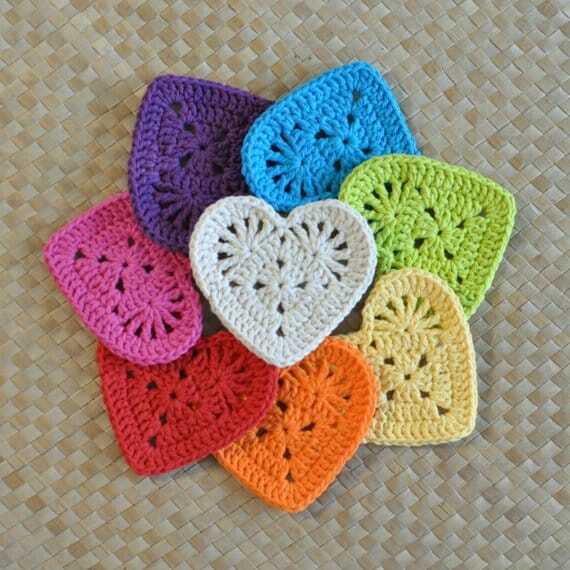 Or you could use them as gift tags, or as a sweet gift for a friend to show you care! So many ideas of things you can do with a simple heart! Ooh and coasters too! I didn’t even think of that! 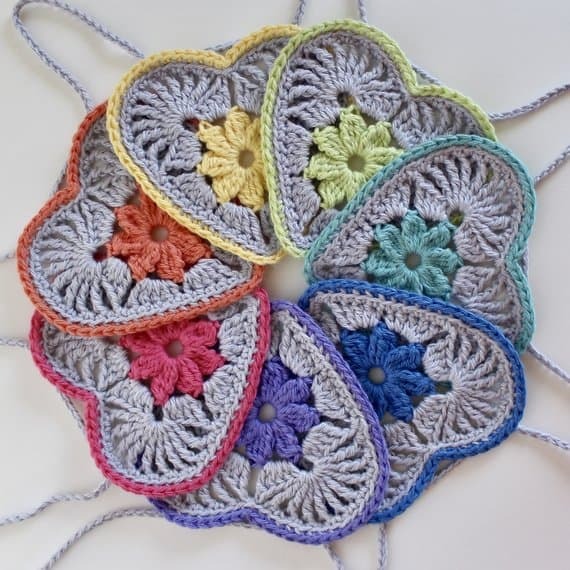 If you’re a fan of granny squares then you are going to love this heart version. It’s an intermediate project but there are tons of photos so if you’re a beginner looking for a challenge you should be able to follow along! I love the little circle details on these hearts that give them extra texture. The circles are added with surface crochet. Ooh these hearts with the little flower centers are so ELEGANT! If you’re looking for something unique to give as wedding favours this could well be the project you need. Or you could add clips to turn them into hair accessories! 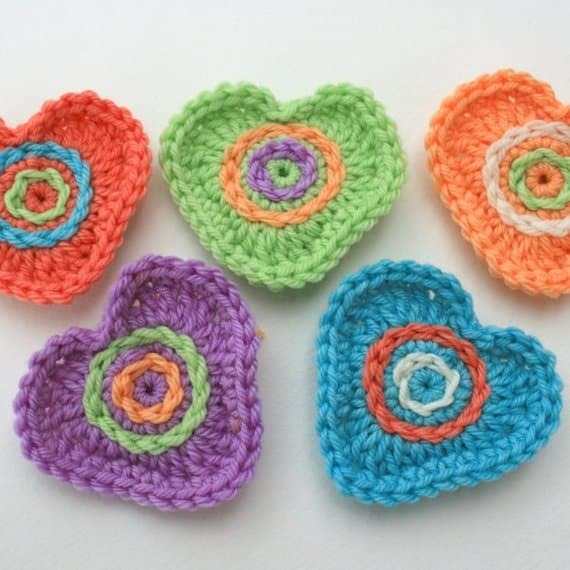 One of the ladies in our heart group has made some spiral hearts like this one and they look FABULOUS! I really want to try this one myself! 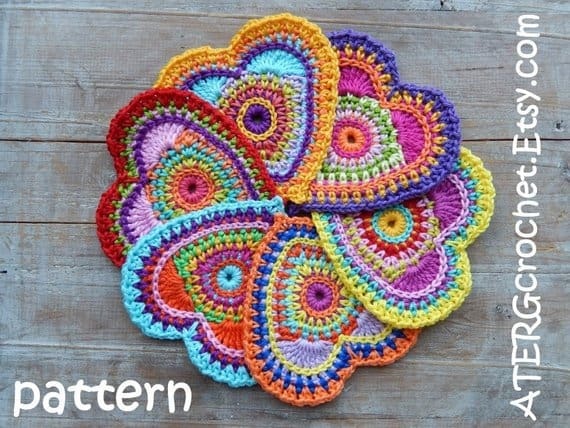 I am a HUGE fan of ATERGcrochet patterns because they are always to colourful with fabulous patterns. This heart pattern is no exception, with the colour burst design they’re just stunning! If nine different colours feels a bit daunting try this three colour pattern instead! They make such sweet keychains don’t you think? They’d make cute party favours or teacher gifts that’s for sure! Wow this heart with a flower inside is so beautiful the two colour design is so striking! This would be perfect as bunting or you could use the motif on a tote bag or blanket. 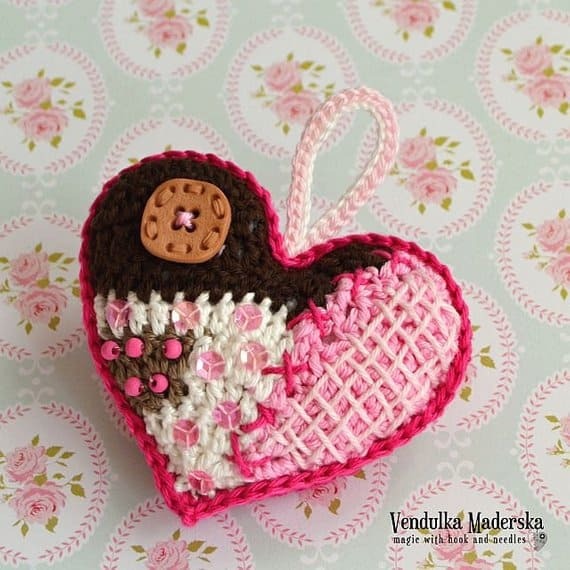 Oh how sweet is this little patchwork crochet heart? I’ve never seen anything like this before with the patchwork effect of the different colours and then the added elements of sequins and buttons. If you make crochet products for sale you will be glad to know that that is allowed in limited quantities with this unique pattern! 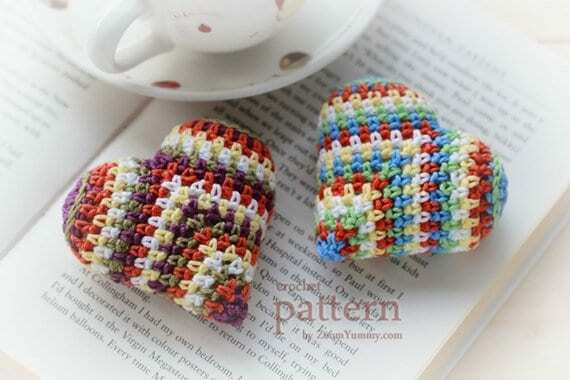 Here’s another padded heart design and I love the stripes! The finished hearts are about 3 inches square and you’re allowed to sell the hearts from this pattern too. 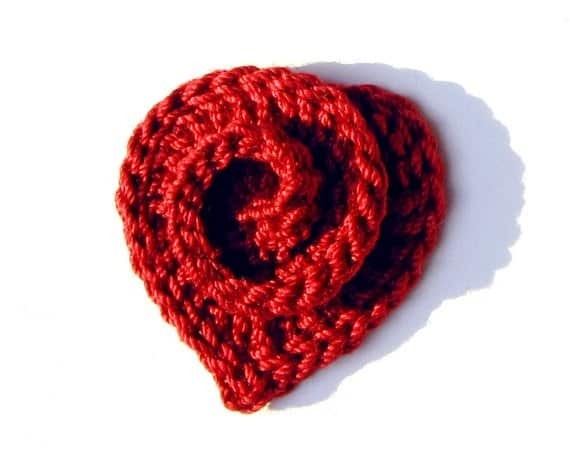 If you’re looking for a stuffed heart pattern that’s beginner friendly then give this one a look. You’ll need to know how to work in the round but it’s a really sweet design. And once you’ve mastered small hearts why not size things up and make a heart shaped crochet pillow! I love the fun design with the pompom edging! It’s perfect for your Valentine’s decor or for your daughter’s bedroom (or yours even)! 20 Edible Valentine’s Gifts that Could Put Cupid Out of a Job!